Except for yesterday’s cool and rainy day, it has been dry and windy all week and despite taking allergy medicine every gosh darn day since the beginning of May, I suddenly find myself sneezing and snuffling. Ugh. That is what comes from spending close to two hours out in the garden this morning working on cleaning up and getting two beds ready for planting. What could I be planting you ask? I got a box in the mail yesterday of items ordered way back in July. Garlic, daffodils, and Siberian squill. Yay! I cleaned up two spots in the veggie garden for the garlic. We got two kinds of hardneck garlic because it is hardier than the soft. There are four bulbs each of German porcelain and Spanish roja. I’ve grown the German porcelain before many years ago and had good luck with it. The cloves are generally large and it has a rich, mild flavor. I’ve not grown the Spanish roja before. The catalog described it as having a strong, rich, hot flavor. I love strong garlic so I hope this lives up to the description. 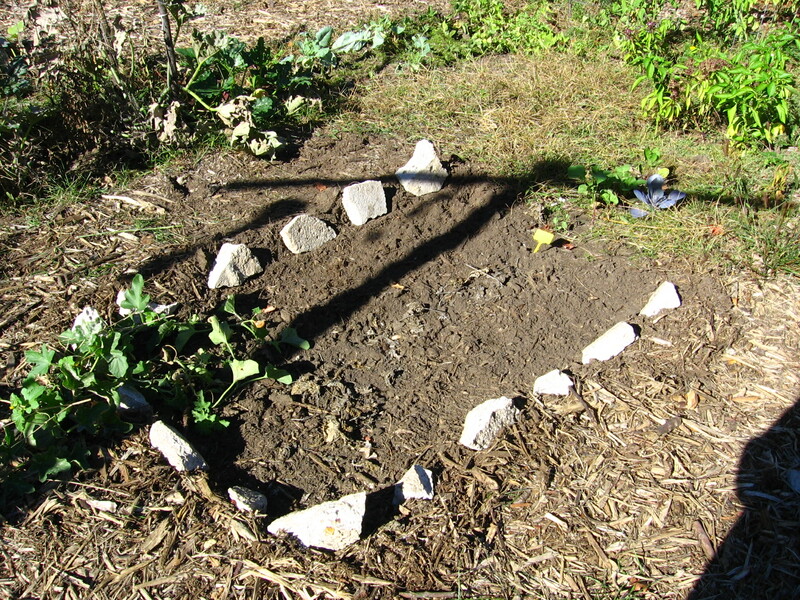 I’ll be planting the garlic sometime during the week after the squirrels cease to be interested in the newly dug dirt. They won’t eat the cloves but they will dig them up and crush them. I got two kinds of daffodils, Dutch master trumpet and professor Einstein. The Dutch master is my choice. A traditional yellow daffodil with a large center trumpet. I have 15 bulbs. Bookman chose the professor Einstein. They are white with orangey-red trumpets. I think they are garish but Bookman likes them for that very reason. We have eight of them. I had thought at first we would plant them all along the new garden path, but being outside and imagining it this morning, I think we will plant them along the path in small drifts in groups of 7-8 and then mix in the Siberian squill. We have 25 bulbs of these. I love Siberian squill. There is a small patch that has grown up in the grass in the back by the deck, leftover from a previous homeowner. It comes back year after year and is, I think, slowly expanding. They are such tiny, delicate blue flowers, a contrast in the spring to all the other brightly colored spring flowers. the snack. The trick is to mix up a solution of alum and water, heavy on the alum, and dip the bulbs in it before planting. I’ve done this with tulip bulbs and long ago with daffodils. Works like a charm. The squirrels generally don’t dig them up then and if they do, before they even take a bite they will get a yucky astringent taste to make them change their minds. It’s nice to have a plan for the gardening week ahead. I enjoy planting bulbs. Even more than planting seeds in the spring, it is a matter of faith that they will survive the winter under the snow and sprout in spring. Everything is winding down. I picked a big zucchini today. I think it will be the last one. We have nine pumpkins waiting for frost to sweeten them up before we pick them and start the process of cutting, baking, and turning most of them into puree. One of them might make it into soup. There are some green tomatoes hanging on. We’ll see if they get ripe before we get a hard frost. Our average frost date is October 7th but the weather forecasters are saying it will probably be mild for at least a week after that. What a strange growing season it has been this year. I picked a few apples last week but most of them still weren’t ready. But looking at them today, yes it’s finally time. Bookman’s wacky work schedule gives him the day off tomorrow and he has decided he will start picking. He is only to pick from the low branches however. No tree climbing without me on the ground spotting him and catching the apples he tosses down. Got that Bookman? No monkey business! 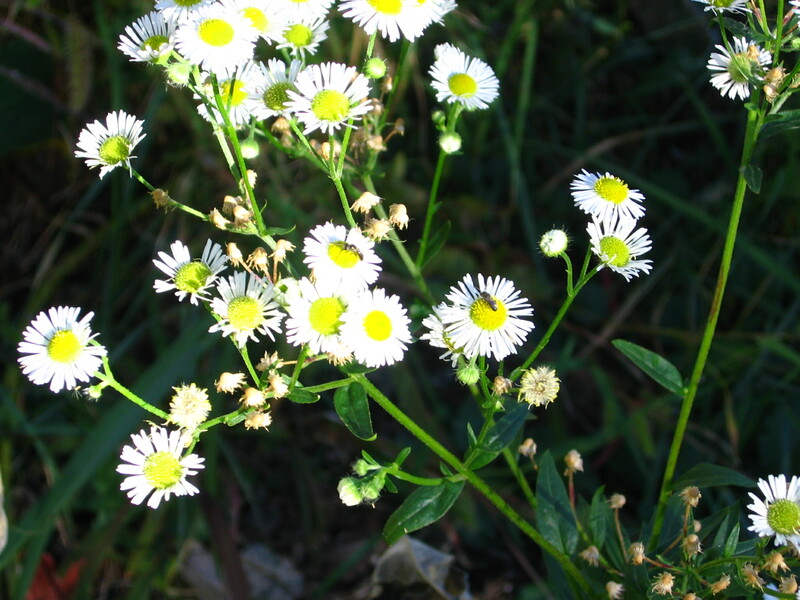 I think the last new blooms this year go to the white asters. These are a native wildflower that has been kind enough to plant itself in my garden. Such a thoughtful little flower I had to let it stay. My hands and back are tired from so much weeding and digging today so time to go give them a rest! Now if there were only something that would protect tulip bulbs from deer. Jeanne, deer is one problem I don’t have thank goodness. I have heard they are more destructive then my busy squirrels so I guess I should consider myself lucky in something! How bizarre about the squirrels and cloves–they are such nuisances those squirrels! You must have learned quite a lot from your gardening adventures about the quirks of yard animals! Do you have flowers in your garden that will bloom in fall? I have always thought it would be interesting to have a garden that blooms in sections all through the winter (I bet there is a name for that sort of garden?). But I am living vicariously through you since I am not a ver good gardener (all thumbs and none of them green!!). How much time a week do you think you spend in your garden? Danielle, I have learned that squirrels and rabbits are a royal nuisance. Rabbits can be deterred by a foul hot pepper sulfur spray we get at the hardware store. Squirrels are more difficult but we’ve managed a few tricks. I was right to not plant anything in the new bed yet because when I got home from work last night it had been dug in. I’ve got asters of different kinds and a sedum, and a few plants that started blooming in late summer that are still going. For the most part everything is starting to wind down and as soon as we get a hard frost it will all be over. In vegetable gardening it is called succession planting but I don’t know that there is a name for it flowers. Most things I’ve read just talk about planning for all-season blooms. How much time I spend in the garden depends on weather and time of year. In spring it is 4-5 hours a week on average, in the middle/end of summer only about 1-2, and now it is getting busy again and will be about 3-4. I’d spend more time if I had it, there is always something to do! Not being an expert on daffodils I must confess I’ve never heard of the Dutch master variety, and I’m already hoping for a photograph of professor Einstein. 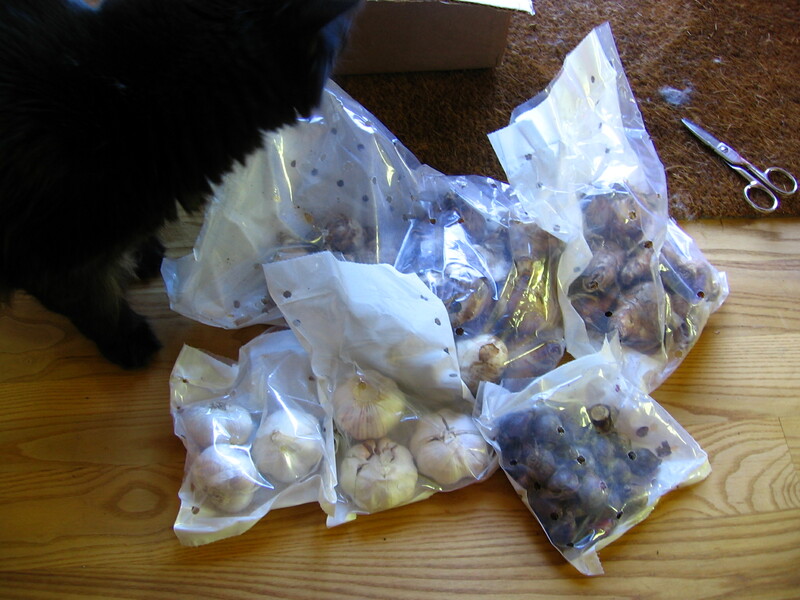 I hope to go chosing bulbs later this week. Cath, I am no a daffodil expert either, there are so many varieties and I have no idea what the difference between a daffodil and narcissus is. Here is a link to photo of Dutch master and here is Professor Einstein. Just so you don’t have to wait until May for a photo from my garden 🙂 Have fun choosing your own bulbs. You will have to tell me what you get! I should get some bulbs in. I’ve spent the whole of today pulling stuff out and cutting things back, which is so dispiriting. Alex, I don’t mind fall chores. I always think of them as tidying up after a party and getting ready for bed. I get a satisfied worn out feeling. Hope you get some fun bulbs to plant! I love reading about your gardening adventures! And, like Jeanne, we have had to look for something to drive the deer away. They even got to some of our succulents! I know they want to eat too but am hoping they’ll find some other tasty things in the wild. Iliana, I am glad you enjoy reading about my garden adventures. Darn deer! I suppose fencing doesn’t really keep them out since they can jump it? I’ve heard some gardeners plant tasty deer shrubs at the edges of the garden in an effort to distract them from going any further. Don’t know if it works though since I don’t have deer. I can say I have tried something similar with squirrels and it definitely doesn’t work with them! whisperinggums, I know the season flew by. Usually by this point I am exhausted and ready to be done with it all but I have had so much fun this year aided by making regular garden reports that I am wishing it wasn’t winding down just yet. From the sound of it lots of places are having strange growing seasons. Lucky for you though to have the pleasure of seeing something you wouldn’t have otherwise!